A planned series of Mass Effect 2 action figures has been delayed yet again and BioWare is hopping mad at the company responsible for making them. 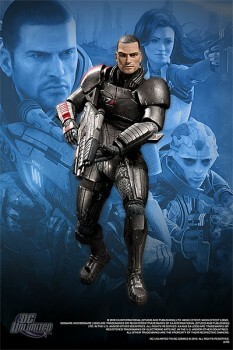 DC Direct, a division of DC Comics responsible for making collectibles like props, prints and action figures, contracted with BioWare last year to produce Mass Effect 2 action figures that were originally scheduled to come out in August 2010. Delays of one sort or another pushed back the launch to February 2011, yet here we are in March and still there's no sign of them. It turns out that the first series of figures has been delayed again, now to the end of April, and BioWare is not happy. "On the ME2 Action Figures it looks like the first series is again delayed. We are all, including Treehouse, BioWare, and yourselves extremely frustrated with DC Direct," Jed Seigle, CEO of BioWare Store operator Treehouse, wrote in a message posted on the BioWare forums. "Their handling of this issue has been extremely unprofessional and disrespectful to fans. Once we get the ME2 Action Figure shipped we will not be working with DC Direct again. I'll update again if we have more news, but it looks like April is correct." The message has since been deleted (although not before it could be scooped up by Google cache) but so, apparently, has a planned second series of Mass Effect 2 action figures, which is no longer on the DC Direct website; BioWare may not want to air its dirty laundry in public but it looks like it's tired of horsing around with a company that can't get the job done. The delay is also holding up shipments to customers who placed orders for both Mass Effect 2 and Dragon Age 2 action figures. Seigle said Treehouse would split the orders into separate shipments at no cost to customers in order to ensure that the Dragon Age 2 figures arrive as quickly as possible.